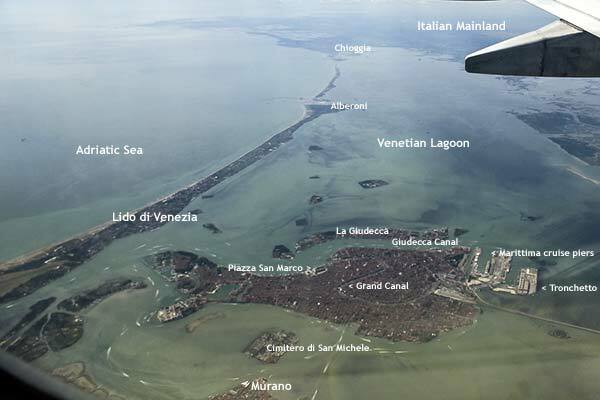 ABOVE: The Lido di Venezia (on left) is a long island that protects the Venetian Lagoon from the Adriatic Sea. The Lido is only a short distance by water bus from the Piazza San Marco and other landmarks in Venice's historic center. The Lido di Venezia is a wide sandbar or barrier island that measures about 11 km (7 miles) long and 700 meters (less than half a mile) at its widest point. On its eastern side (left in the photo above), it has a long series of beaches that face the Adriatic Sea. The western waterfront faces the Venetian Lagoon, the city of Venice, and the Italian mainland. Two shipping channels mark the Lido's northern and southern boundaries: On the north (just to the left of the top photo), the Porto di Lido is used by cruise ships, ferries, and other ships. To the south, by the village of Alberoni, the Porto di Malamocco connects with the Malamocco-Marghera ship channel, which is used by freighters and tankers on their way to the Marghera industrial port on the Italian mainland near Venice. BELOW: The Porto di Lido, with Punta Sabbioni on the left and the Lido to the right of the ship channel. The Adriatic Sea is in the distance, beyond the gap. Most of the Lido's hotels, restaurants, and shops are near the "Lido di Venezia" label in the photo at the top of this page. The main commercial street, the Gran Viale Santa Maria Elisabetta, runs across the island from the Adriatic beaches to the ACTV vaporetto (water bus) stop on the Lagoon. For a more detailed overview of the Lido, see our Lido Map, which is a Google satellite map that you can zoom and drag.